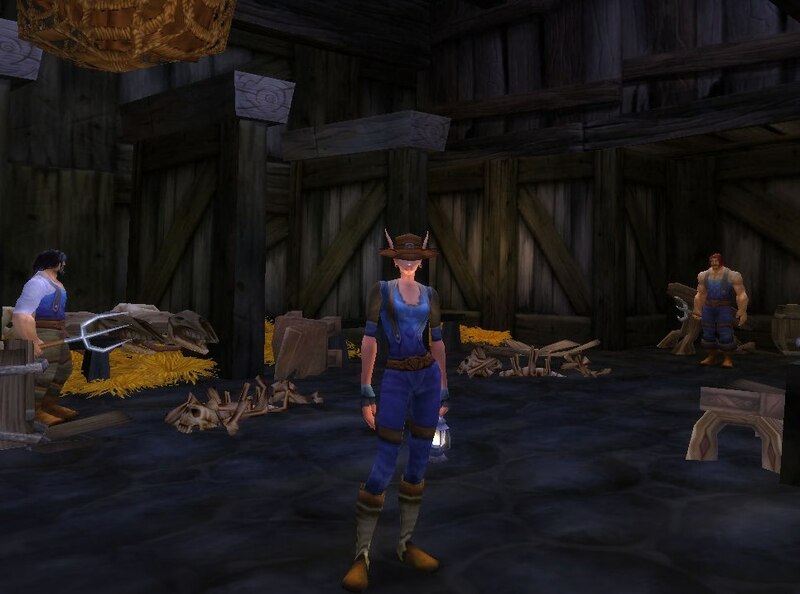 You work hard all the time…breaking your back mining, slicing into a freshly killed animal for its valuable skin, or maybe just grinding through hundreds of mobs to find that one special thing you are looking for. Whatever your job is, it’s a dirty one, but maybe these outfits will help take some of the drudgery out of your task. 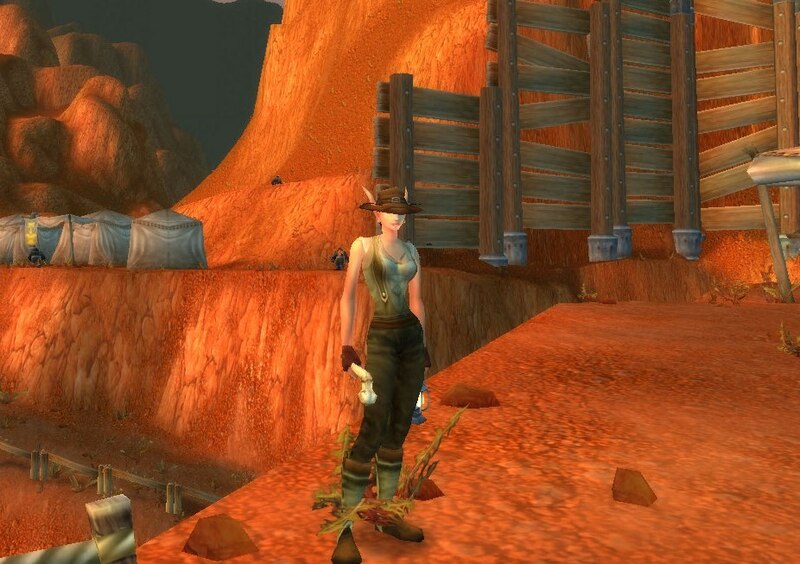 In this article, I’ve also included some archeologist outfits for Cataclysm’s new secondary profession, archaeology (I’m really excited about it ^_^). I do not know what all there is in store for it fashion-wise, but, I would hazard to guess that there will be more off-hands added…maybe a different type of hat…we’ll see. And, who knows, it may need its own article by the time Cataclysm comes out. Do to numerous off-hands/weapons and hats, these outfits are easier to put together (imo), and have a more obvious look to them as to what they are supposed to be for, rather than The Crafter or The Mystic outfits. The one look I was going for in the mining outfits were for simple, rugged pieces of armor. I figured that miners, in general, would care more about comfortable, easy to work in clothing, rather than stylish clothing. This is a pretty classic look, and, you can never go wrong with a chest-piece like the Bandit Jerkin (or any of its look-a-likes in different colors) for work clothes. I chose to stay within the realm of cloth for pants because I figured leather (and mail and plate….) would be too hot and sticky once the body started to sweat chipping away at heavy rocks. 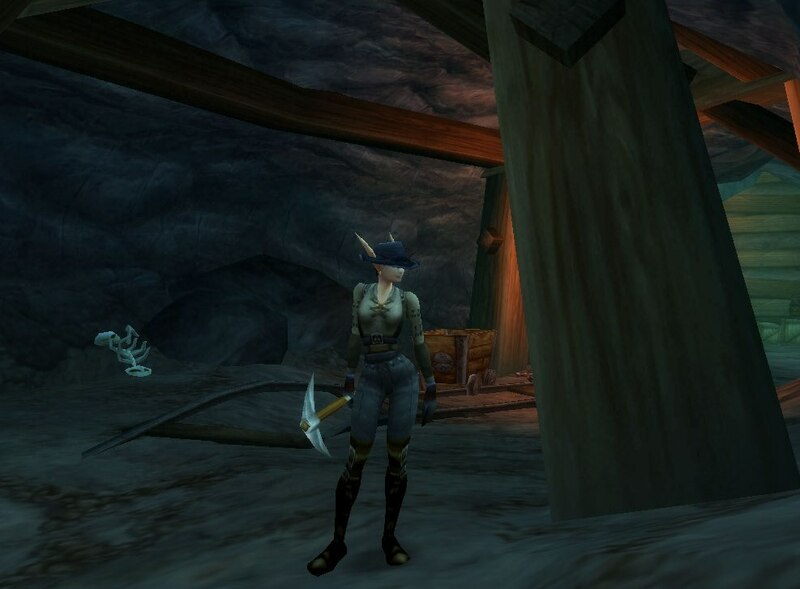 The Mining Pick is, obviously, the best choice of offhand/weaponry for a mining outfit. This vendor bought item can be equipped by anyone as it does not actually require a mining skill to use. 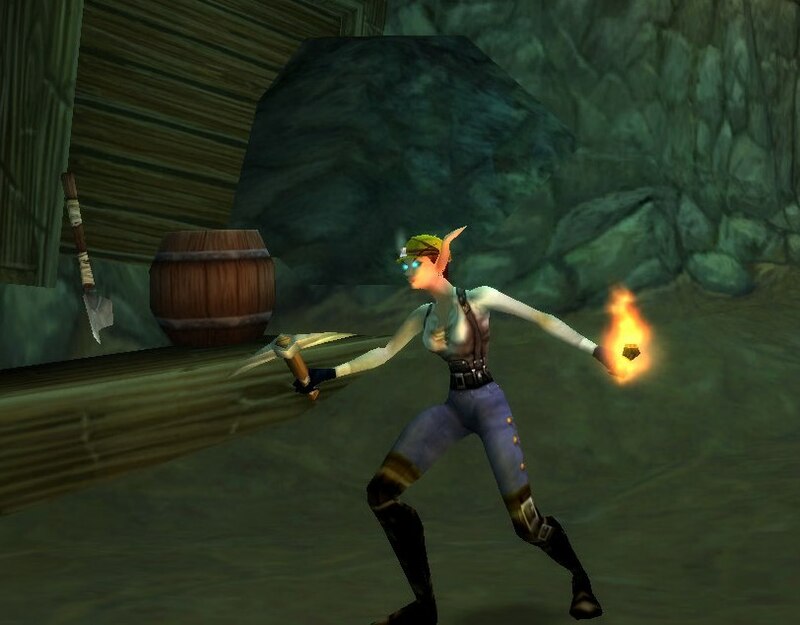 Other mining picks can be seen here; other off-hands could be a light source, like the torch pictured, or a lantern of your choice. 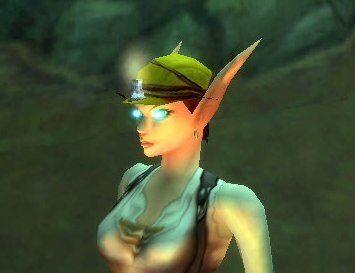 Because Merlaina is an engineer, she made herself, and can wear, the engineer-only Goblin Mining Helmet. Some other helmet choices like this one that do not require an engineering skill are: the Expert Goldminer’s Helmet, the Miner’s Hat of the Deep, and the Underworld Helmet. This next outfit is extremely easy to put together, and is aimed to be an outfit without any BOE pieces. That way, you can send the outfit to an alt when you need extra bag space (possibly after collecting all those ores ^_^). A non BOE vest could be added to this outfit, but, I felt the shirt was suitable enough. Its brown suspenders blend well into the Knitted Belt. Other colors of the Lumberjack shirt could be used, and don’t forget about the Workman’s shirts! 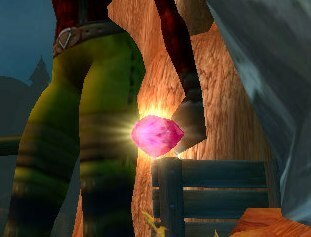 Another mining off-hand could be a gem – like Merlaina’s Demoniac Soul Prison (quest reward), seen here. Other gems in the same style can be seen in this comparison, while other gem-like alternatives can be seen here. The Duskwoven Tunic has MANY (too many to list) alternatives in different colors, and even longer and shorter sleeved styles. The lighter leather style of the Inscribed Leather Pants are perfect for deep cave mining where the environment may be cold and damp. The mining profession is easy to dress up for. If you are leveling mining, and will be in a certain zone for a while, think about the “climate” / work environment that zone is in and plan an outfit around that fact. Skinning is another profession that has many options to it. What I focused on for these outfits were leather/mail armor pieces that looked like different animal skins. A good place to start when searching for armor to use in this type of work outfit is the different styles of leather-working crafted items. This all leather ensemble can be achieved with lots of different armor than the ones listed. If you want to do an “alternating fur” outfit, try to find pieces that greatly contrast in color. There are many vendor-bought “fur pieces”, like the Rough Leather set and the Tanned Leather set, that can be mixed and matched with each other, or with other fur-pieces like the many gray-level items, such as Patched Leather set. Like the Mining Pick, the Skinning Knife offers a cheap and pertinent off-hand to accent your outfit (or, you are using one already…); it can also be used with any profession. The Gryphon Mail pieces can be substituted for other feathered armor, such as the Feathered Breastplate, the Windhawk pieces, and the Iron Feather Set. The Lord Sakrasis’ Scepter is just an accent item that I felt went along with the skinning profession. Like the outfit before it, this ensemble uses the Scalemail Vest as a sort of “scaly” alternative to either feathers or fur. There are many other scaly looking mail armor pieces, and leather pieces too, in many different styles and colors. The Thread-Bare Cloth Pants play in well with this outfit, as they are cloth pants that look like leather (there are many other alternatives to these pants). The blue accents on the pants matches the Black Swashbuckler’s Shirt…which, is more of a dusty navy blue than black. The Rough Leather pieces throw in that “bear fur” accent without making the outfit too overBEARingly furry (lawl ^_^). 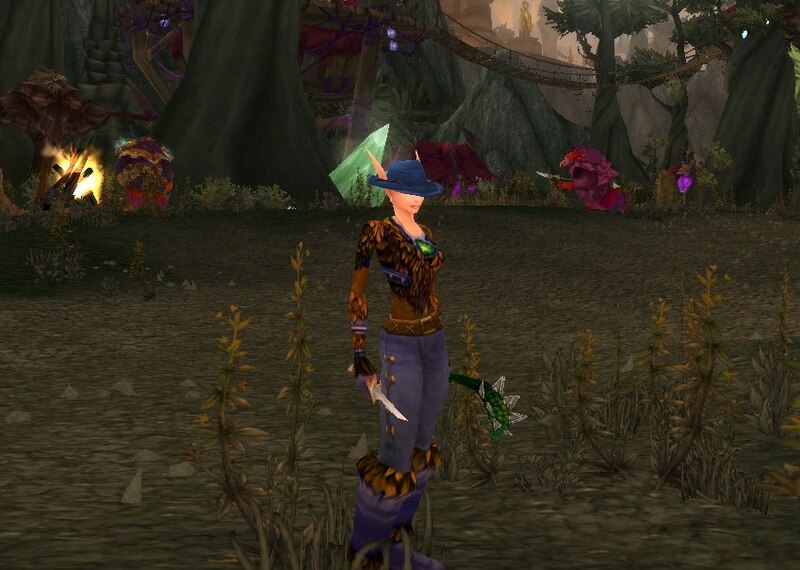 The Stylin’ Jungle Hat can be replaced with the Battered Jungle Hat, or any other desired helm. White fur pieces make a great skinning outfit when skinning prey in snowy areas…. (I guess that was an understatement? 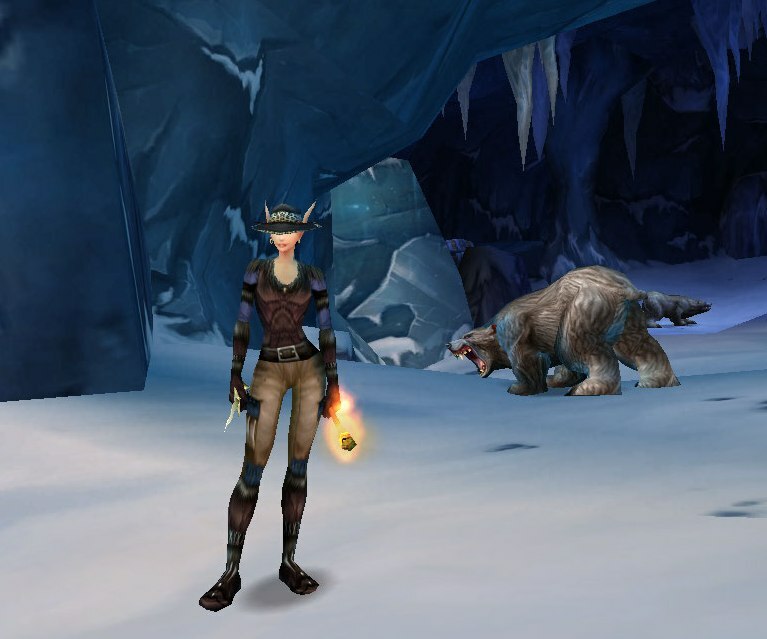 )…anyway…^_^ For alternatives to the Horde-vendor Snowhide items, other white fur armor includes: the Boneshredder set, the Ghostwalker set, or just the tunics the White Leather Jerkin or the Frostmane Leather Vest. This outfit uses the Buccaneer’s Gloves to represent previously white gloves getting spoiled by skinning; because, I imagine it’s a pretty bloody and gruesome ordeal. 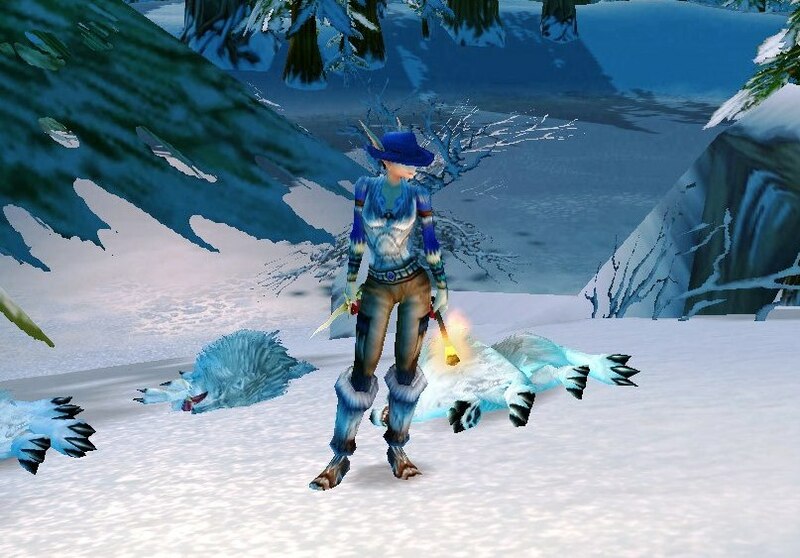 The Silver-lined Bracers actually dropped off one of the pictured wolves, Timber. Again, like the mining outfits, skinning outfits are easily put together when you narrow down the type of skinning your character will do. Think about what he/she is skinning and use elements from those animals in their outfit. As I said in the introduction, these outfits are for the new secondary, archaeology, that will be available once Cataclysm strikes. These can also be adapted for mining outfits, and vice versa. 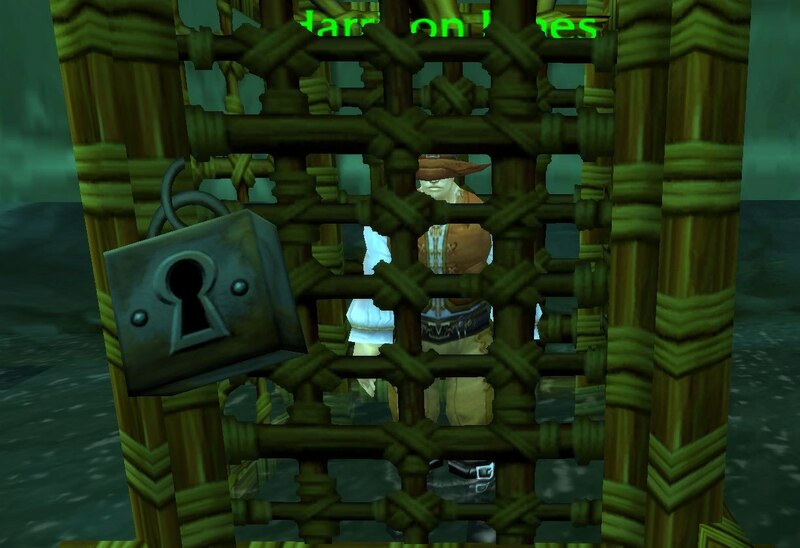 A caged Harrison Jones…I could not get my own picture of him out of the cage, and, no one was around to do the quest to “rescue him”…I mean…”let him rescue you”. 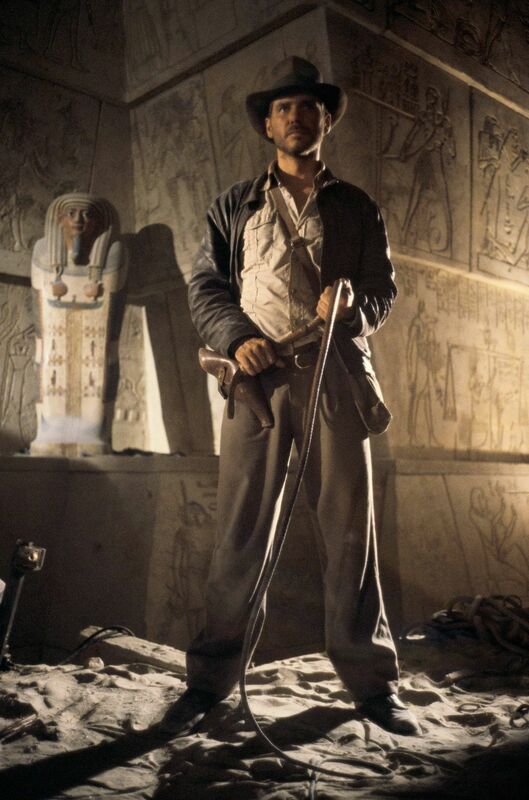 While it’s not exactly the traditionally famous Indiana Jones outfit, Harrison Jones’ outfit is pretty simple to put together: Weather-Beaten Fishing Hat (or I’ve seen the Noble’s Monocle on him too), White Swashbuckler’s Shirt, Foreman Vest, a belt like the Feralfen Sulker’s Belt, pants like the Ranger Pants, and the Recruit’s Boots. The Foreman Vest is the only vest in this style in a brown color (that I know of). 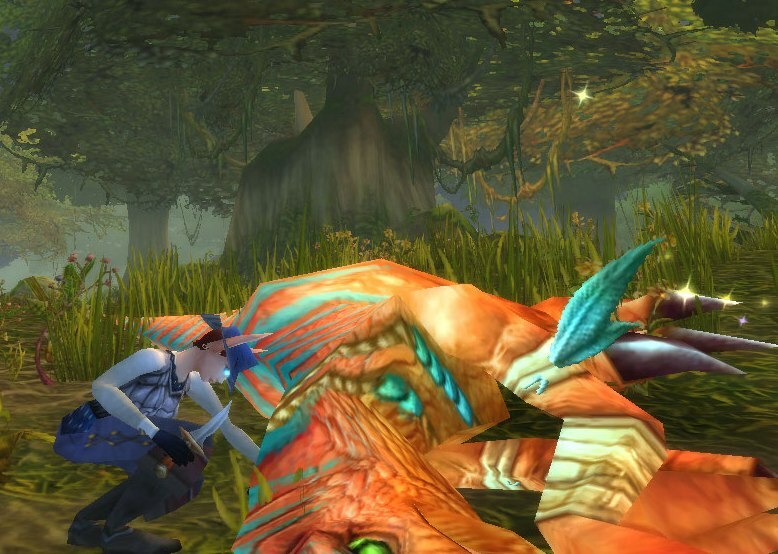 It is dropped by the rare mob, Gibblewilt, in Dun Morogh. 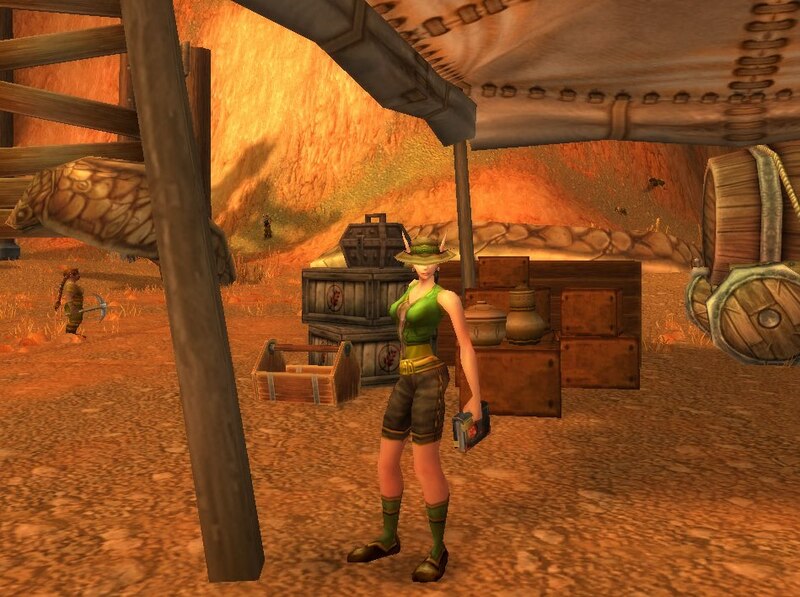 The Mixologist’s Tunic can be replaced for the Recruit’s Shirt; however, that greenish/brown tinge is lost, and the latter shirt may not match well if you choose to still use the Durable Pants. Other off-hands besides a torch could be a lantern, and/or some kind of “fossil” bone. I choose to use the Serenity Belt because it blends in well with the yellow-gold of the shirt and the green from the vest and hat. A book off-hand, like Kirina’s Milli’s Lexicon, can be used for the archaeologist to take notes in…or maybe it was dug up? LoL ^_^. 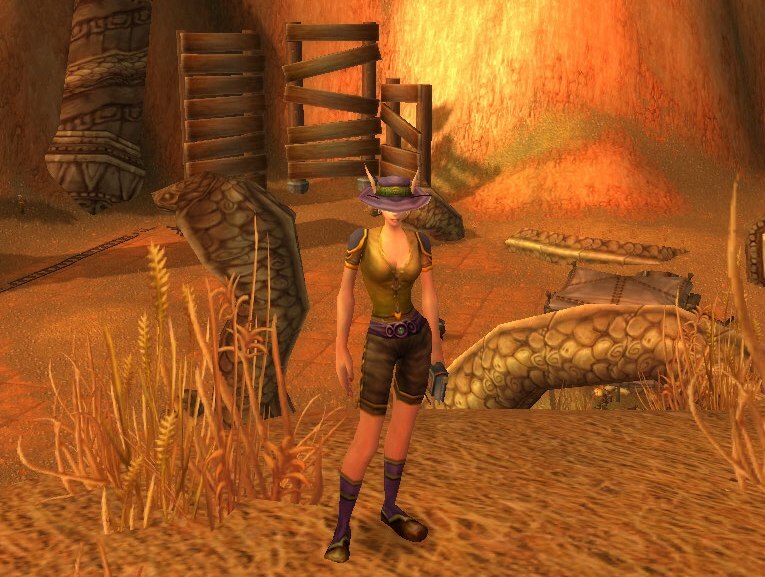 I love the Vindicator Boots – the same style as the Padded Boots, but, perfect for strolling around Dalaran. As I said before, this is not my limit on archaeology outfits, and, I can not wait to see what Cataclysm brings so I can add to this section…it might have to be an article on its own! We have all gone “farming” one time or another…probably more than some others. 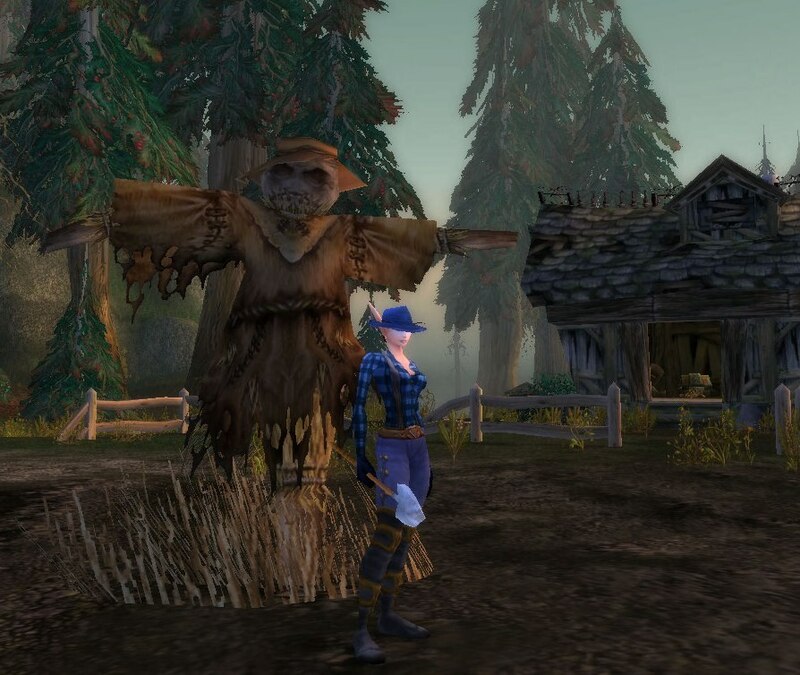 And while the majority of our “farming” takes place at our highest level (to sell our wares on the auction house for big bucks! 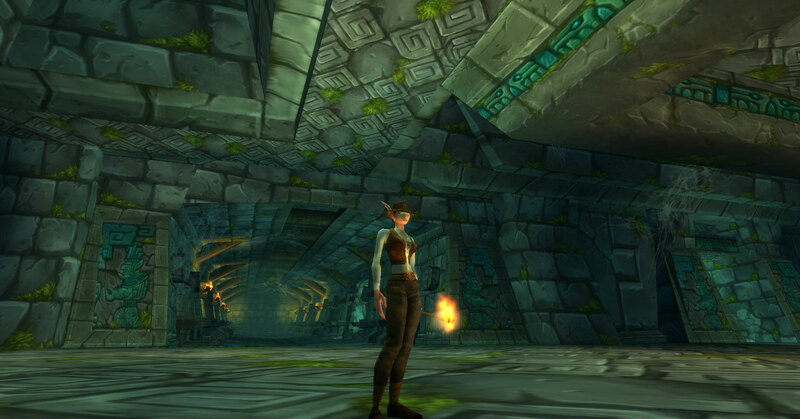 ^_^), sometimes it brings us back to the lower levels where we would not necessarily need our best gear on. For those cases, consider some of these outfits. This first outfit was from the original version of this article…you can not go wrong with a classic! This outfit uses the shirts already built-in suspenders, which bled into the brown Knitted Belt. One farming must-have weapon is the Pitchfork. 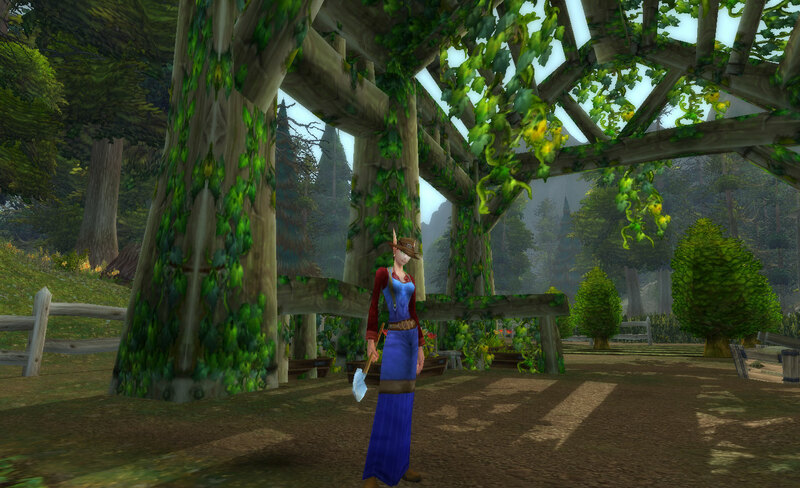 It’s easily obtainable killing the farmers around in Hillsbrad Foothills, but, other weapons with the same style are the Rusted Pitchfork and the Pitchfork of Madness. 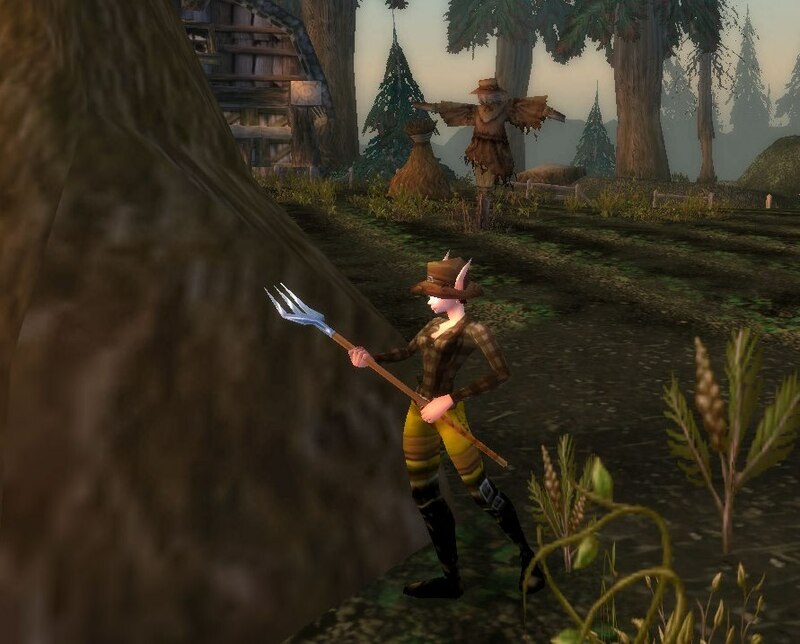 Another farming weapon is the aptly named Farmer’s Shovel, which can be obtained by farming either Farmer Solliden and/or the Tirisfal Farmers. Other shovel models include: the Kobold Mining Shovel, the Shoveler, the Burrowing Shovel, the Goblin Power Shovel, and the Silver Spade. 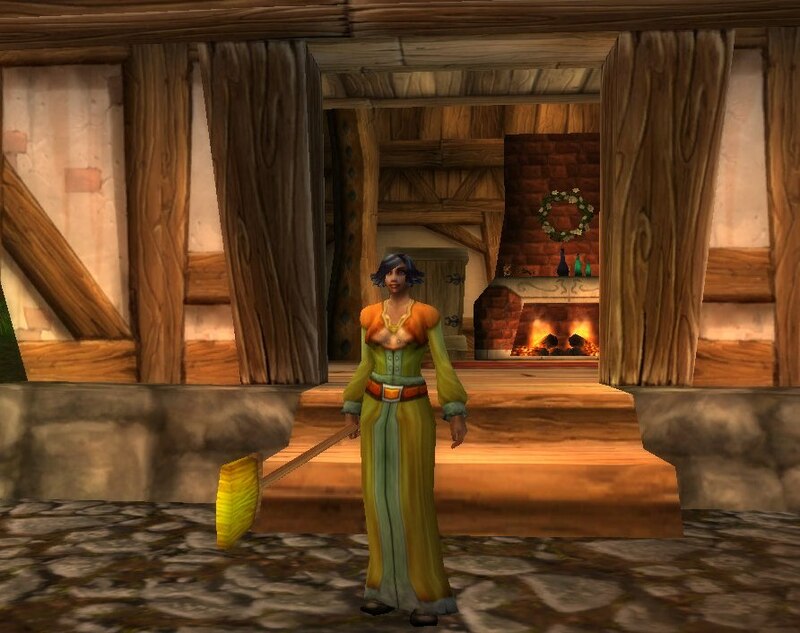 The Harvester’s Robe was an Alliance quest reward, but, this style of robe is not uncommon; other options include the Darkmoon Robe, the Unkempt Robe, or the Neophyte’s Robe. 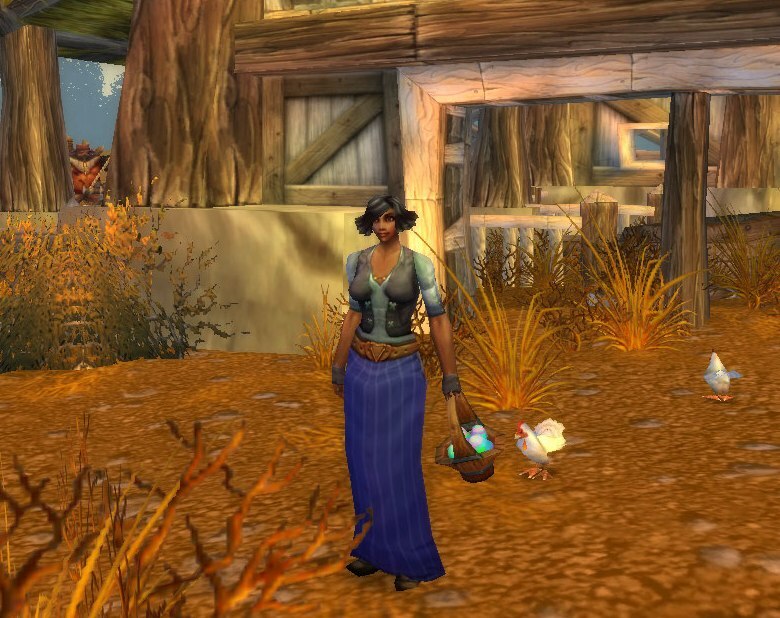 The Farmer’s Broom is farmed from the Tirisfal Farmhands. The Brocade Vest can be substituted for any of the other vest/shirt combo chest-pieces, like the Canvas Vest or the Cross-Stitched Vest. I know, I know, the Egg Basket is notoriously for spring and Easter. But, really, at a glance, the eggs look like regular eggs ^_^ And, it’s another non-2-hander off-hand that is farm related. I really wish I had my wish granted for more everyday off-hands (like the “Farm Egg Basket”), but, oh well. The same outfit, only with the Common White Shirt instead of an actual chest-piece. 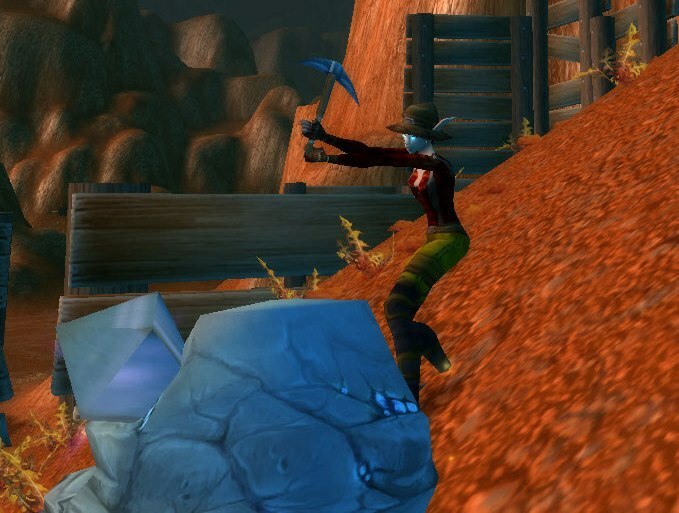 Brand new from Cataclysm questing, its….THE ONE-HANDED SHOVEL MACE!!! (/kisses Blizzard’s creative team). Finally, Kirina can do some digging of her own! 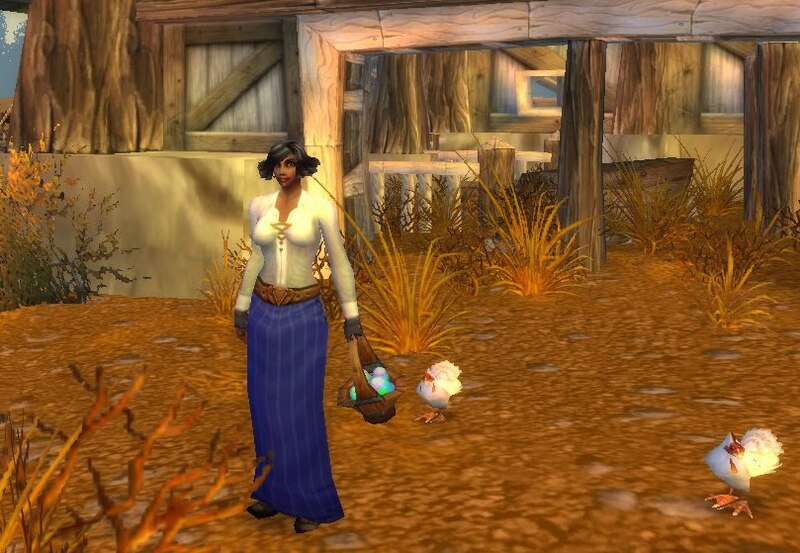 While I know some of these items require a bit of pre-farming before you have an actual farming outfit, try to keep your outfit simple and relatively non-BOE; that way, should the need arrive, it can be sent to an alt for more bag space. 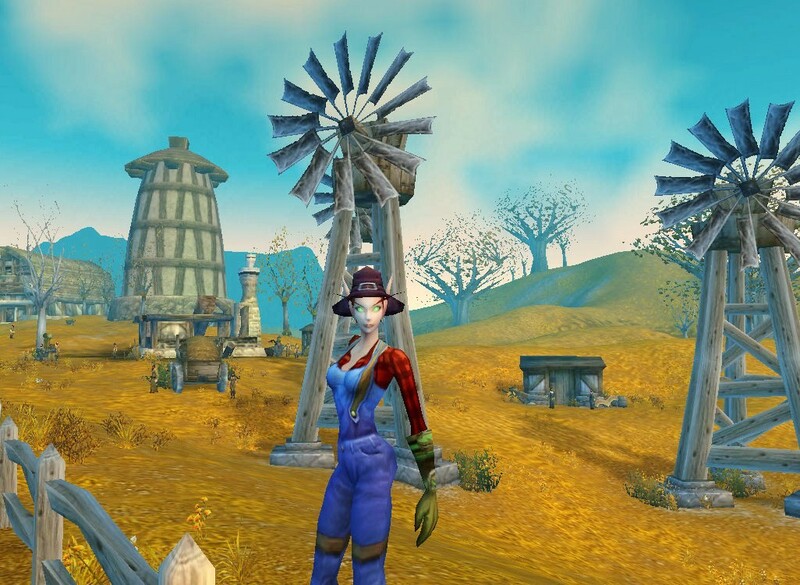 And, any of these outfits, or ones that you come up with, do not necessarily have to be worn when farming for items – wear one while hanging around in a farming community/town ^_^. There are plenty of different types of armor to make more creative workman outfits than what I put together. However, I hope these have given you an idea of what you could create and expand from.